Bath lifts are used inside a tub to raise and lower the person in and out of water. Most are made of rust free aluminum and germ resistant plastic materials. All models are battery operated, and will not lower when battery capacity is below safe level. 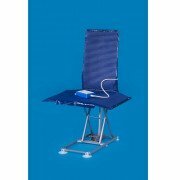 Some of our models recline for extra comfort, and have swivel seats to facilitate easy transfer in and out of the tub.